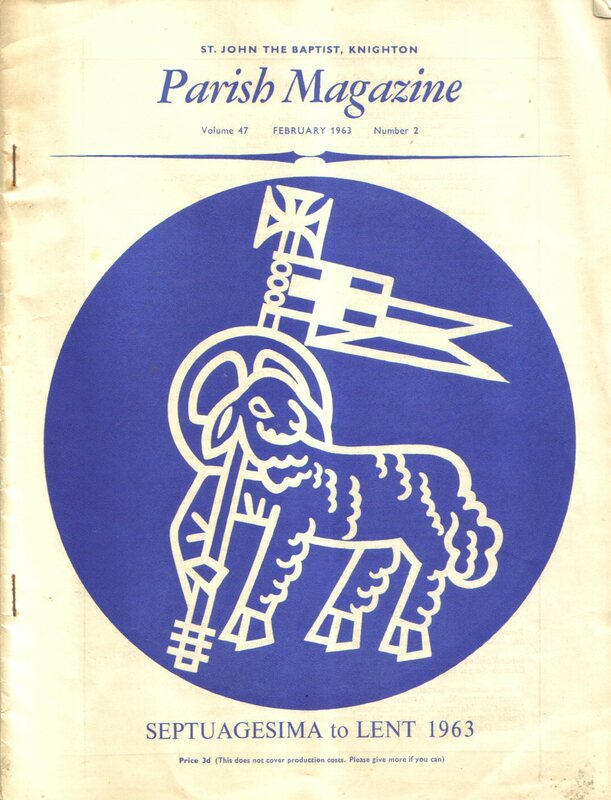 Following on from my post about Clarendon Park Road in 1960, I dug out another Ebay find – the Parish Magazine of St John the Baptist, Knighton (now Clarendon Park), Septuagesima to Lent 1963. It’s rather nicely produced, printed in dark blue ink and with a charming enclosure: “Are YOU coming to the St John’s Parish Social?” The magazine contains a list of clergy, churchwardens, services, Sunday School and group leaders, and a letter from the vicar, the Reverend Canon F D H Harris-Evans, in which he refers to a new oak screen which was then being erected in the church (later removed). There was also a new notice board being planned, which anyone involved with church affairs will imagine took as long and arduous a path to completion as the screen. Although the magazine was published in 1963, it could easily have been written at any time in the fifty or so preceding years. There is an “appeal” for a live-in companion help to two maiden ladies, one of whom was the former headmistress of St John’s Infant School. The Mothers’ Union, the Church of England Men’s Society and the Youth Fellowship were all active but a truly modern note was struck by the Young Wives with their talk on Avon cosmetics and ‘Health Films’ (the mind boggles). The names of those mentioned in the magazine are listed below – do feel free to contact me if you would like full details of anyone. 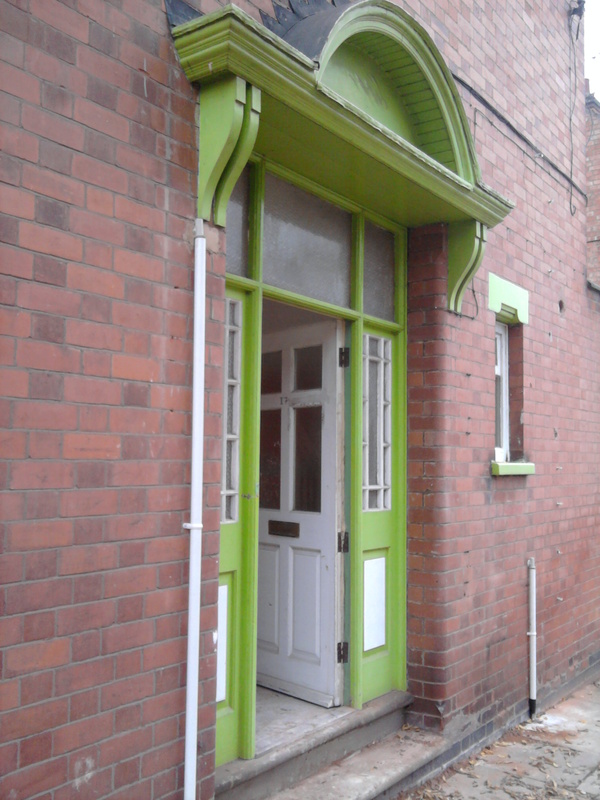 Today I spent the day at Leicestershire Records Office and spent an hour looking up electoral registers and street directories for 17 Lytton Road, and I think that with Rosemary’s help and Helen’s mother’s help, I have a pretty good idea of who occupied the shop premises right from when it was first built. Telephone directories have helped a lot too, but blimey reading them online is hard work on the eyes. It looks like the shop was first occupied in 1907 by one Robert Edwin Stokes, draper (1873-1957), or at least the shop was in his name but in the 1911 census it was his wife Sabrina who took the title of draper whilst Robert was a postman. Robert, Sabrina and their son Cecil Robert lived in the six rooms with their niece Katie Hawkes who acted as drapers assistant, and their servant Robert and Selina stayed there until some time during the first World War, when it was taken over by Miss Mary Annie Inman, now also a draper but previously having been a boot hand as were so many in Leicester. Maybe Robert or Sabrina found war work elsewhere? Miss Inman (1881 -1968) seems to have lived alone apart from a brief period around 1921, when she had her younger brother (or possibly it was her father of the same name), Frederick Inman living with her. Miss Inman was at 17 Lytton Road for a long time – until her retirement in 1945, when she handed over the premises to Walter and Ivy Moore. Ivy ran the shop as a drapers, making and selling children’s smocked dresses, and acted as a receiving office for Wigston Laundry (according to Kelly’s Directory 1947). They were joined in 1947-8 by Robert Taylor, perhaps a lodger? By late 1950 Walter and Ivy had gone, to be replaced by Nellie and Roy Tester. Nellie called herself simply ‘shopkeeper’. 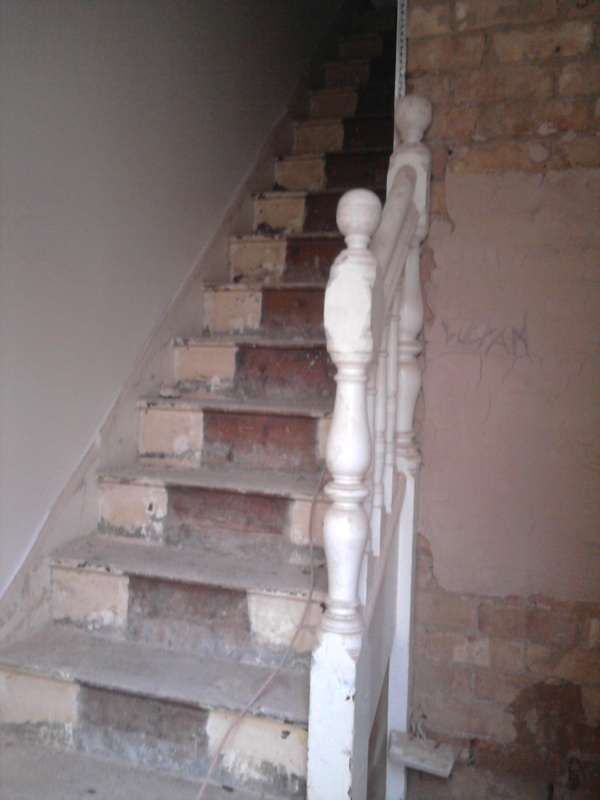 It looks like the Testers were the first to get the telephone installed (number 77734). 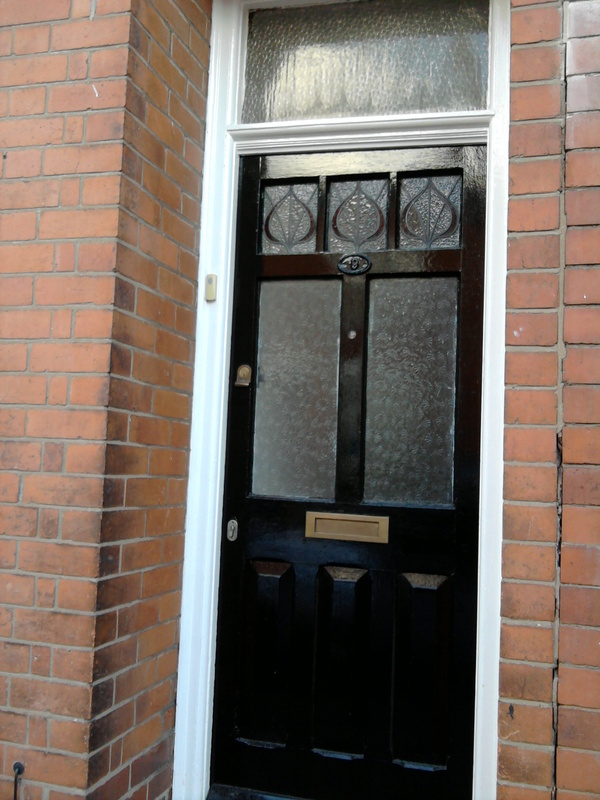 After Nellie and Roy Tester left in 1958, a period of unsettlement began at 17 Lytton Road, with many changes of hand in a short time. 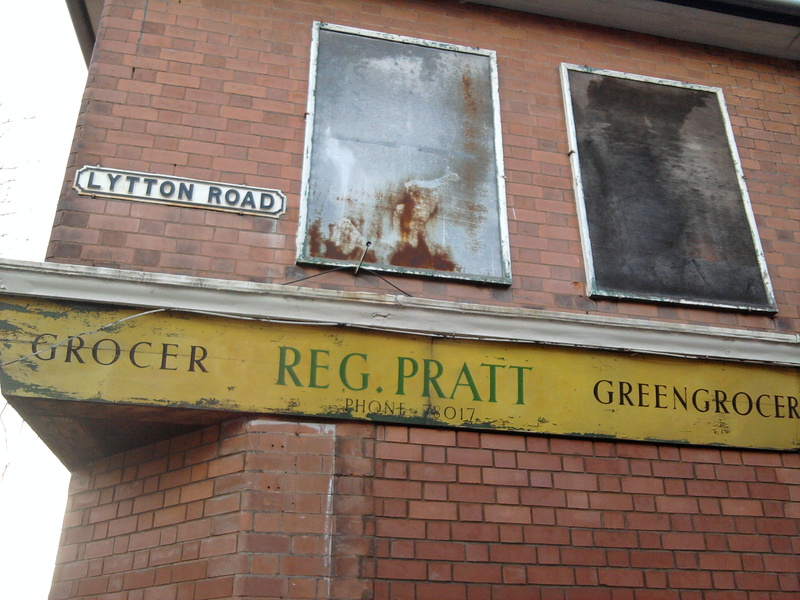 From 1959 – 1961 Reginald Pratt ran it as a greengrocers with his wife Mary. 1961 – 1963 Frank George and Mary Lily Noble were greengrocers there (F G Noble, tel 78017). 1963 – 1966 the shop was occupied by Trevor Victor and Evelyn E Batt, grocers, with the same telephone number. Philip and Kathleen Edwards ran a grocers 1966 – 1972, and then in 1972 – 1975 James John Crisp and his wife Muriel(still with the same phone number 70817) lived there, with Margorie Ruth Wightman and Dora Helena Parnell – possibly students or lodgers? They stayed on for a further year after Mr and Mrs Crisp had moved on. Things settled down after that. Between 1976 and 1989 Urmila and Manubhai Patel were at 17 Lytton Road – possibly the nice Asian people who ran it as a grocers, as remembered by Rosemary? I haven’t recorded the occupants after that as it feels a bit intrusive. Claude Francis Alexander was born in Leicester in 1893, the eldest son of George Alexander (1870-1949) and Sarah Mutton (1872-1927). Claude and his siblings Reginald George (1895-1955), Charles (1897-1925) and Marjorie Florence (1910-) lived firstly at one end of Hartopp Road – number 116 – and then at the other. When Claude and Reginald signed up to join the Territorial Army it was while the family was living at number 9 Hartopp Road. The family were Baptists. Claude joined the Leicestershire Regiment in October 1914, when he was working as a clerk for a shoe manufacturer. He started as a private but was promoted to lance corporal in 1916, and 5 months later to corporal. Claude served in France, returning home briefly every year. In 1917 he suffered a wound to his left knee and spent a couple of months in hospital in Bristol, but returned to France and was killed on 17th July 1918, less than three months before the end of the war. He is buried at Fouquieres-les-Bethune, Pas de Calais, along with 386 of his compatriots, mainly fellow Territorial forces. He never married. Claude’s brother Reginald survived the war. He joined the Territorial Army in 1913 aged just 17 and just 5 feet and 5 inches tall when he was a clothing dresser in the emply of Messrs Thorneloe Clarkson (in Northampton Street). Sadly records of Reginald’s full service are lost, but we do know that he married Doris Stuffins in 1928 and lived in Leicester until his death in 1955. After I posted about the newly revealed sign at the corner of Howard Road and Lytton Road (address number 17 Lytton Road), someone put me in touch with a very nice lady called Rosemary who lived for 74 years at number 74 Lytton Road. I had a chat with Rosemary about the shop and unfortunately she didn’t remember Reg Pratt, but she was able to tell me a few other interesting things about it. When Rosemary was a child (from the 1930s onwards), the shop was occupied by Miss Inman who was a draper and haberdasher, selling baby wear, hooks and tapes, ladies’ jumpers etc. 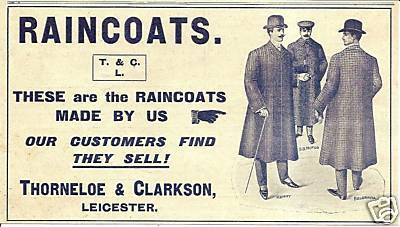 This tallies with what I was able to find out by looking at Leicester directories from 1908 and 1916, when the shop was a drapers owned by Mr Robert Stoke and Miss Nellie Lamb respectively, and then in the 1928 Kelly’s Directory Miss Mary A Inman. 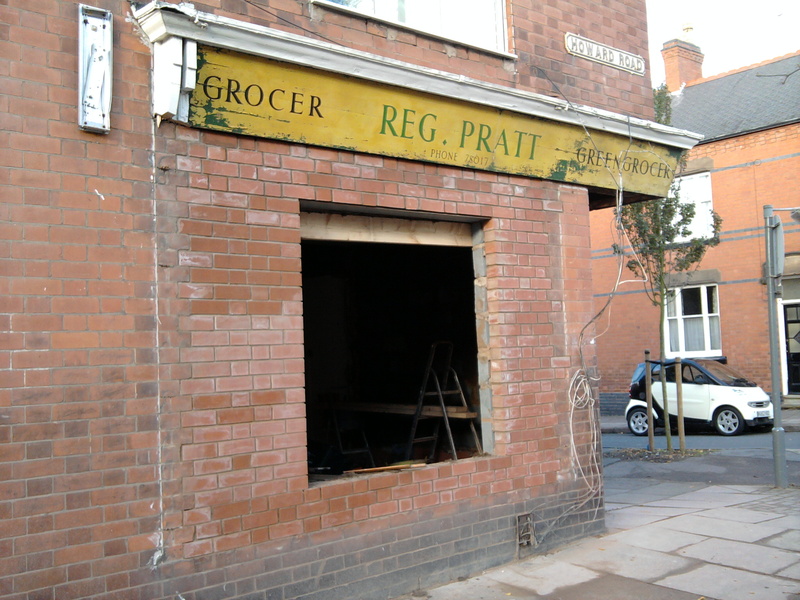 After Miss Inman retired, the shop was bought by a lady who ran it as a very nice grocers. Her husband was a postman and nearing retirement, when something awful was discovered. 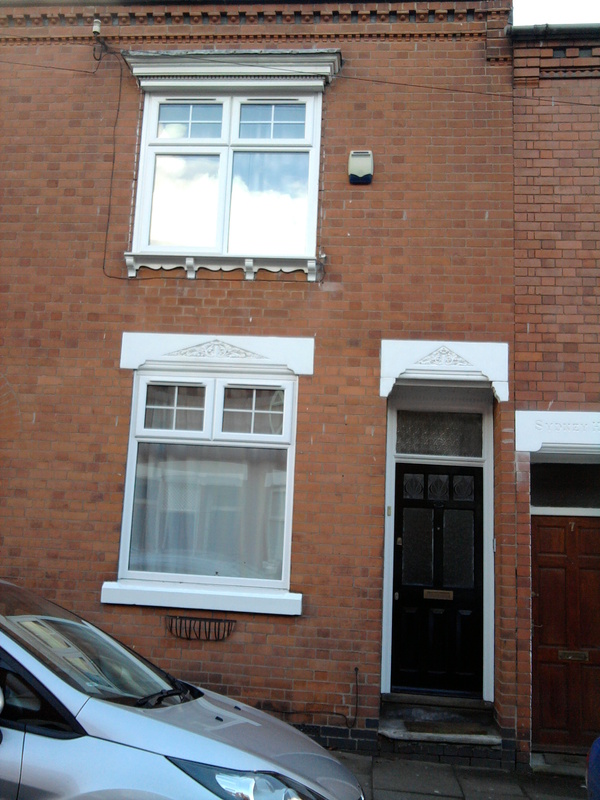 He had been taking parcels and registered letters meant for delivery, and hiding them in the shed at the bottom of his garden at number 17 Lytton Road. None of them were opened, so the man hadn’t been gaining from his crime, but nevertheless it was a serious matter and he had to leave the Post Office and also lost his pension. It was a great scandal in Clarendon Park and the couple left the area soon after. Rosemary remembers that an Asian family took over the premises and kept them as a grocers, very well run. The husband left to become a religious leader in his faith. It became at some point a computer shop for students, and after this a clothes recycling shop that no one ever seemed to go in. I was walking along Howard Road yesterday afternoon on my way back from the record office, and this rather charming sign was uncovered. The building is yet another being converted from a shop into a house – hopefully with more sensitivity than some I have seen lately. Does anyone know anything about this business on the corner of Lytton Road and Howard Road? R Pratt (greengrocer) appears in Kelly’s Directory of 1960 at 17 Lytton Road, telephone number 78017, which seems to be the same premises. Also on Lytton Road that year were Tandy Brothers Ltd (painting contractors) at number 16, G G Marriott (painter and decorator) at number 31, and Thomas Albert Viles (boot and shoe repairer) at number 63.